How Do You Translate a Function? Think about sliding a penny on a table. All you're doing is moving the penny to a new location on the table. That's basically all that's happening when you translate a function! When you translate a function, you're just sliding it to a new location on the coordinate plane! What Does Absolute Value Mean? In this tutorial you'll see how you can think of absolute value in a very intuitive way. Let us know if you have any questions about it! Transformations can be really fun! They allow you to change or move a figure. In this tutorial, learn about all the different kinds of transformations! What Does the Constant 'h' do in y = |x-h|? When you're learning about translating absolute value equations, learning about horizontal translations is a MUST! Check out this tutorial and see what it takes to translate an absolute value equation horizontally. What is an Absolute Value Function? An absolute value function is just a function that contains absolute values. This tutorial gives a great introduction to this very useful function! What Does the Constant 'k' Do in the Function f(x)=[square root of](x)+k? 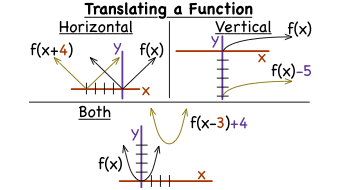 When you're learning about translating square root functions, learning about vertical translations is a MUST! Check out this tutorial and see what it takes to translate a square root function vertically. What is a Quadratic Function? You can't go through algebra without seeing quadratic functions. The graphs of quadratic functions are parabolas; they tend to look like a smile or a frown. In this tutorial, get introduced to quadratic functions, look at their graphs, and see some examples of quadratic functions! How Do You Graph a Translation of a Function? A great way to better understand how to translate a function is to practice! This tutorial takes you through the steps of graphing a function that's been translated up and to the right.